The interplanetary manned spacecraft Pegasus carries its five-person crew on a grand tour of the Solar System during "Voyage to the Planets and Beyond," a mock-documentary of human space exploration of space. Mosttelevision science fiction shows fling humans out to the vast reaches of thegalaxy, but a new DVD is content with exploring our own planetary backyard. Originallyentitled "Space Odyssey" during its airing on the British Broadcasting Co.(BBC), "Voyage to the Planets and Beyond" follows five astronauts on a missionto explore the Solar System aboard their vast spaceship Pegasus. A DVD versionof the two-hour program is available from BBC Video. 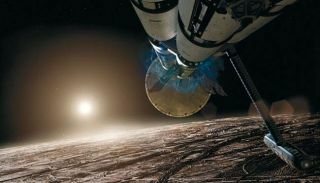 Themock-documentary chronicles the Pegasus crew and mission flight controllersduring a grand tour that swings past Venus, Mars, Jupiter and Saturn,with a final reach toward Pluto and a comet before heading home. Developed bythe makers of "Walking with Dinosaurs", "Voyage" combines spectacular images ofspacecraft and landers with live actors interacting - sometimes under actualweightless conditions aboard parabolic-flyingaircraft - with one another on a long-duration spaceflight. While itssix-year mission timeline, among other things, seems a bit unrealistic - ittook NASA's Voyager 2 probe twice that long just to swing past the outer gasgiants - "Voyage" does offer a compelling look at how humans might explore theplanets and the challenges they could face. Radiation hazardsand homesickness, as well as the closeness among Pegasus' astronaut crew andthe near identical look of the ship's science bay with the interior of theInternational Space Station (ISS), all point toward a focus to recreate whattoday's space agency's could accomplish if they put enough money and man-hoursto the task. "One of ourguiding principles was to get as close to the truth as possible," said Tim Haines,"Voyage" executive producer, in a telephone interview. "We have someone die ofradiation sickness simply because it would be impossible to be out there thatlong without some problems." A failedprobe aimed at Saturn's moon Titan was another deliberate choice to illustratethat things don't always go as planned during space missions, Haines said. But,he added, there was an ulterior motive. "We knew ...there was going to be going be a landing on Titan, and we didn't want to get itwrong," he said. TheEuropean Space Agency's Huygens probe successfully landedon Titan on Jan. 14, 2005. ESA commentators specifically pointed out "Voyage's"lost Titan probe during their pre-landing discussionsand hoped Huygens would fare better. The ESA probe was carried to Titan aboardNASA's Cassini orbiter. "Voyage"producers did consult with astronomers, planetary scientists and astronauts toadd a bit of authentic flair. The results yield intriguingly designed landersand spacesuits to handle a variety of environments, among them the harshpressure of Venus' atmosphere and the intense radiation on Jupiter's volcanicmoon Io. But thereare some points in "Voyage" where the "mock" in mockumentary becomes apparent. At onepoint, after receiving conflicting telemetry about the closeness of a passingasteroid, flight controllers yield to the mission's lead scientist, who directsthe Pegasus crew to photograph the space rock rather than move to a safedistance to the obvious chagrin of the astronauts. And whether a mission'sflight director, in reality, would allow a long-duration crew to add threeyears onto their flight after the death of a crewmember is also up for debate. Even Hainesconcedes that a life-saving device - a magnetic field generator - that shieldsthe Pegasus crew from potentially deadly solar and Jovian radiation, may be anunattainable piece of technology. "One area thatwas very gray was that magnetic field generator," Haines said, adding thatwhether such a device would provide adequate radiation shielding, or even bepossible to power with the Pegasus' nuclear reactor, is an open question. "Wefretted over it for awhile, but eventually kept it because it acknowledged thefrailty of the astronauts...and humans were the center of this." Thein-flight video of astronaut discussions, regrets and even sickness aresometimes heartwrenching with drama, though it is on Earth - before the Pegasuscrew flys - that the spacefarers sound the most like real-life U.S., EuropeanRussian astronauts. And the human angle is only part of the story. In additionto the two-part "Voyage" program, series producers also include a 50-minutedocumentary on real-life robotic explorers of the planets visited by thePegasus crew. From Russia's Venus-bound Venera landers to the hardy fleet ofspacecraft aimed at Mars, Jupiter and Saturn and other planets, the feature shineslight on the continuous space exploration that has gone one since humans lastwalked on the moon. "So many peoplefocus on and know only about the manned exploration of space, but there is somuch more," Haines said. "I think there's a tremendous romance about poor oldVoyager so far from home...and those are extraordinary achievements."